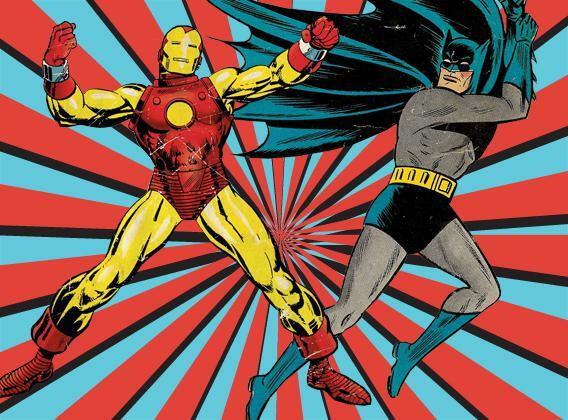 Marvel vs. DC Comics: One is just like Iron Man, the other like Batman. Who would win in a fight: Marvel or DC? Photo illustration by Slate. Iron Man and Batman cover images courtesy Marvel and DC Comics. At a tender age, most fans of superhero comics start honing their arguments in an ancient debate: “Which is better—Marvel or DC?” They may not yet realize that the fight has long been waged not just on the page, but also in boardrooms and on the NYSE. To understand the battle between the two major American mainstream comic book companies, we can go straight to the source material, because each is very much like one of its biggest franchise players. Marvel, it’s fair to say, is Iron Man; DC is Batman. Still, they used to be more cooperative rivals. After a string of parodic storylines in the ‘60s and ‘70s (in which Marvel’s Avengers fought the Squadron Sinister—a thinly disguised version of DC’s Justice League—and the Justice League returned the favor by battling the Champions of Angor, who were the Avengers in all but name), the two publishers reached a sort of détente. Between 1976 and 2003, there were a string of co-published DC/Marvel crossover comics, in which Superman would meet Spider-Man, or the X-Men would fight the New Teen Titans; Iron Man and Batman even encountered one another in JLA/Avengers. These days, each company makes a great show of pretending the other doesn’t exist, aside from the occasional sideswipe. Once DC got into the habit of referring to its fictional universe as the DCU, for instance, Marvel named its all-you-can-read digital initiative Digital Comics Unlimited. As you’d expect from colorful characters, both publishers have weaknesses that can be turned against them. Marvel publishes more iterations of its biggest titles than Iron Man has built models of his armor, which can make it nearly impossible for casual fans to figure out what to read. So, wait, if I want to check out the series of books where Spider-Man is an African-American/Latino kid named Miles Morales, is that Amazing Spider-Man, Superior Spider-Man, Essential Spider-Man, Ultimate Spider-Man, Ultimate Comics Spider-Man, Marvel Universe Ultimate Spider-Man or Spider-Man 2099? DC, likewise, has a Batman-ish tendency to alienate its allies and collaborators. Artists and writers have complained of constant editorial second-guessing over the past few years, as sales of most of its superhero titles have spiraled downward. The company burned some bridges with Before Watchmen—a set of prequels to Alan Moore and Dave Gibbons’ perennially best-selling graphic novel Watchmen, produced over Moore’s vociferous objections. And the adventurous, creator-driven DC imprint Vertigo was gutted with the departure of its executive editor Karen Berger early this year. So enough wind-up—who wins the Iron Man–Batman showdown? It turns out that there’s an Iron Man 3–like twist: The rivalry that counts is between the real-world equivalents of Stark Industries and Wayne Enterprises. Within the past few years, Marvel and DC have changed their names, from “comics” to “entertainment” companies, to reflect where the real money is: in film, TV, and games. Marvel will sell, perhaps, a few million dollars’ worth of Iron Man comic books this year, while the worldwide gross of Iron Man 3 so far is $1.2 billion and counting. If every monthly issue of Batman sold as well as this June’s (they usually don’t), the series would gross about $6.8 million this year, or roughly 1/150 of what The Dark Knight Rises has made so far. So both companies now effectively treat their comics divisions as research-and-development arms, since, on the economic scale of film studios, it’s astonishingly cheap to commission material from even top-tier comics writers and artists, print it up, and see how the fans respond. DC hasn’t been doing badly in theaters, especially if you can wipe Jonah Hex and Green Lantern out of your mind. The Dark Knight and The Dark Knight Rises were huge hits, and this summer’s Man of Steel performed decently, too. But there’s not much on the other side of “To Be Continued” at the moment. DC announced a Superman/Batman movie at Comic-Con last month, but the long-rumored Justice League film is a distant dream, especially since they haven’t been able to get Wonder Woman off the ground as either a movie or a TV show. Meanwhile, there are seven forthcoming movies about Marvel characters that are far enough into production to have announced release dates. The snag is that Marvel Entertainment doesn’t actually control the movie rights to all of their characters, thanks to deals cut long ago. (The recent Arrested Development gag about a Fantastic Four movie made in six days for legal reasons isn’t far off from what really happened in 1992.) Sony’s got Spider-Man, and plans to release three more Amazing Spider-Man movies between now and 2018; Fox has the film rights to the X-Men (including Wolverine), Daredevil, and the Fantastic Four. Even so, what Marvel Studios has been doing with the characters the company does control—fitting their stories together into the “Marvel Cinematic Universe” that began with the first Iron Man movie in 2008, reached fruition with last year’s Avengers movie, and continues with the upcoming S.H.I.E.L.D. TV show—is a brilliant idea (and, naturally, borrowed from comics). Right now, DC’s Batarangs don’t stand a chance against Marvel’s repulsor rays.